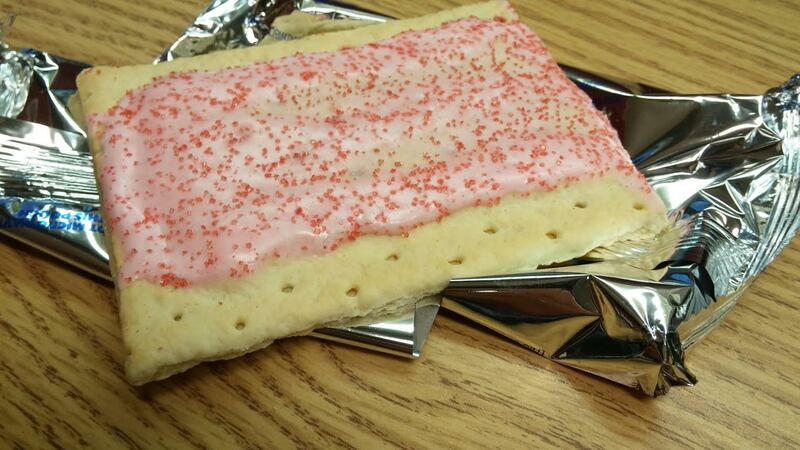 Two days ago I ate my last pop tart. It was delicious. We had a good time, you and I.
I call it my last Pop Tart because if you’ve read my latest blog posts this week then you already know I’m taking baby steps to improve my health, my weight, and my relationship with food. This all came about after I read Amelia Freer’s book called Eat. Nourish. Glow. – I’m trying to buy more organic foods. Yeah, they cost more so I’m being selective. I was recently told that if you only switch to 3 organic things, switch your milk, eggs, and chicken. I can do that! The reason is because the same hormones they give to cows and chickens are the same hormones cancer feed off of, particularly breast cancer (both in men and women). I found organic, cage-free eggs at my grocery store for just $2.99. That’s actually cheaper than what I normally pay for eggs so I was happy with that. I also picked up organic Amish milk and organic unsweetened Almond milk this week. – I’m trying to cut down on my intake of sugar. That’s the reason for the last pop tart! I stopped using sugar in my coffee and hot tea years ago, and as some of you may know, I even gave up coffee about a month ago. Amelia lives a sugar-free life and believe me, that’s tough. Sugar is in everything, particularly packaged and processed foods which Amelia also says you should give up. Just read the label. I never worried about sugar content before because I’ve always been a calorie counter. But Amelia says if you put your focus on sugar instead, then the rest like calories and carbs will balance out. And she’s right! My organic Almond milk has zero calories! Sadly, my regular Amish organic milk had 12 grams of sugar per serving! So, this step will continue to be a work in process but it definitely helps you in changing your eating habits. If you cut sugar from your diet, your taste buds will change. And I actually experienced this last night. I made pasta for dinner. More about that later. And I used Ragu pasta sauce. The sauce tasted so sweet….I noticed how sweet it was more so than ever before. It was gross. I finished the pasta and tried to eat as little of the sauce as possible. I’ll definitely be making more of my own sauce this summer when my homegrown tomatoes ripen. – I’m no longer cooking with olive oil. Yeah, everyone has preached the benefits of EVOO the past few years, but guess what? It doesn’t react well to heat! Olive oil should only be used to make salad dressings, or use it by itself on salad. That’s it! It’s good for you that way, but not as a cooking component. You should use coconut oil, coconut butter, or regular organic butter for cooking. They taste better and are actually better for you. Coconut oil or butter or real butter even contain healthy fats that your body needs. I found a jar of coconut oil at my grocery store and have been cooking with it this week and it’s great! And no, it doesn’t make your food taste like coconuts at all. I also picked up organic Amish real butter this week. – I bought a veggie spiralizer, also called a Veggetti. It’s a nice little kitchen gadget that turns vegetables into veggie pasta. I tried it this week with a squash and a zucchini. I boiled them for about a minute and served them with basil pesto and it was wonderful. I’ll definitely start cutting down on my boxed pastas now because guess what…they contain sugar! I do buy frozen ravioli and frozen tortellini for us sometimes and that’s what we had last night for dinner that I mentioned earlier. I was happy to see that the frozen ravioli contained no sugar and the tortellini only contained one gram of sugar! So, that’s where I’m at as week one comes to a close. I still have some things to work on when it comes to what to eat for breakfast and lunch but I’m working on it. Amelia’s approach is slow, and I’m okay with that. She says you are NOT on a diet. You are just fixing your relationship with food. And I like the sound of that. I’ve made dinner every night this week. We’ve had no fast food. I’m cutting sugar. I’m making other small changes like the cooking oil, milk, and salt. It all adds up, and it all equals healthier living. Welcome to the journey!!! I am excited for you! You will start to find the taste buds changing even more than they already have: the fruits will taste sweeter and have more depth and vegetables will have more flavor as well. BTW, I have had that same revelation with the commercial pasta sauces. If you are open to it, I can recommend a couple of good you tube videos that got us started on the same path. Hi Lori- Absolutely! I appreciate any suggestions or feedback you have. I tried the smoothie recipe you suggested and wasn’t a fan but it was mainly because our juicer was wasting so much pulp. We threw it away and will probably invest in a Ninja or Magic Bullet. What do you use? Also, are you 100% sugar free? If so, any suggestions on how to build on this lifestyle?